Flash a remote village on the borders of Cheshire, Staffordshire and Derbyshire has a number of claims to fame. It is the highest village in England 1518 feet above sea level. Its location made it a town for counterfeiting, ‘flash money’; a more dubious claim to fame perhaps. 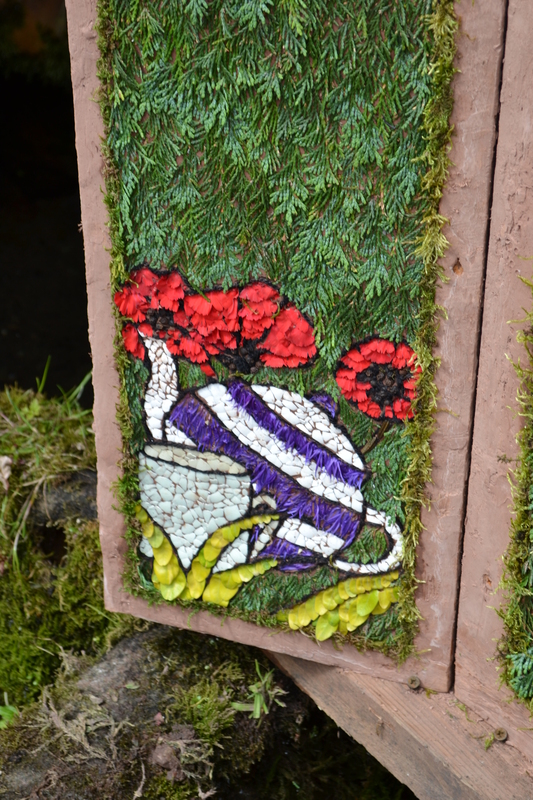 A better claim to fame is that it is home to the Flash teapot parade, a far more wholesome claim and not just because it involves tea! Doug Pickford in his Earth Mysteries of the Three shires makes an interesting observation, a teapot would have been an odd commodity for a remote community to have, and believes it has a more ancient origin from the Celtic Taoiseach (pronounced tea shock) for leader! This he believes may be more significant for when the find was dissolved no teapot was found!! A point I raised with one of the organisers, who thought it was interesting idea, although did say the teapots were those belonging to the individual members. It is an interesting point, perhaps greater research may reveal the answer. No flash pan! 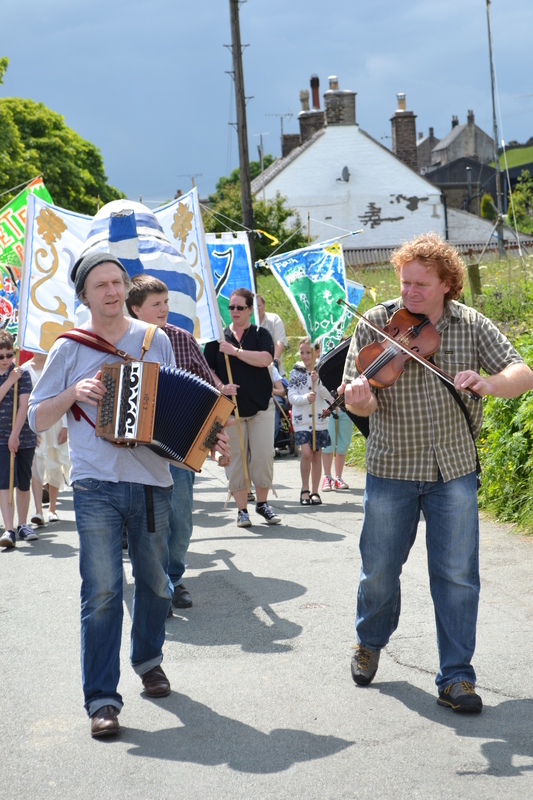 This parade of course is a sort of facsimile, a copy but without an association with the group it was based on. Why? The fall, quite literally, of a notable newspaper magnate and the subsequent disappearance of millions of pounds of pension money, had a big effect. Why should that have an effect on a remote village and its custom? New laws on saving organisations had their impact and as such the small volumes controlled by the group could not be legally collected and so in 1995 the Flash Loyal Union friendly society was finally dissolved and its banner was laid over the church door. However although in 1995 the last authentic Flash teapot parade finished, 1996 saw it continue as a village tradition organised by the locals as a valid attempt to keep the custom alive. No doubt due to the remoteness of the communities here it continued for longer than most. 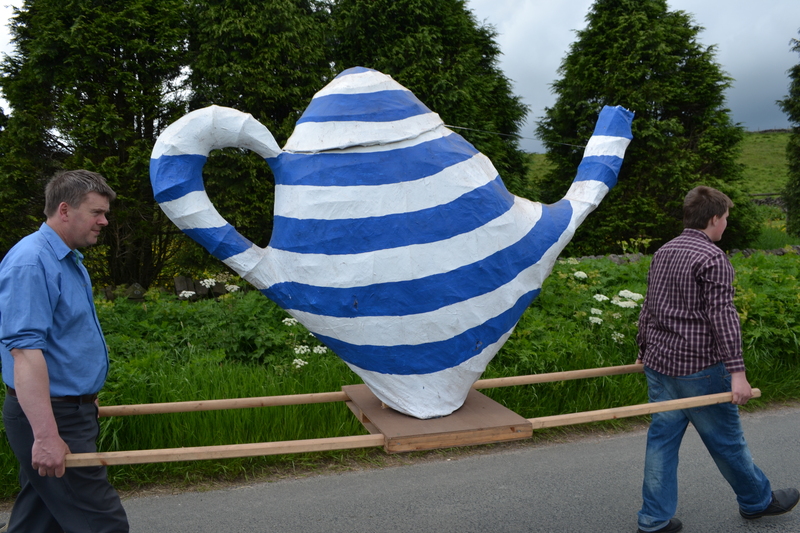 This re-invention rather than revival was a conscious effort by Andy and some other local incomers and involved the children making banners and significantly a giant teapot! She also added that for several years a play was performed on how the society was formed. This sadly has lapsed. Of course, this being the Peak District, something was missing, then in 2006 a well dressing was introduced and this continues to this day. However, all in all, this custom remains a unique addition to the year’s calendar especially if you like a cuppa.